Difficult Substrates Solved. Roundup of Adhesion Promoters. Adhesion promoters enhance ink and coating adhesion on difficult substrates from aluminum and brass to granite and metal. They are available in water-based, solvent-based, and UV-curable configurations. Applied by hand or with an automated system, many options complement inkjet printing. This article and the following one in the series includes information from vendors offering adhesion promoters for digital printing. Afford Industrial S.L. offers several adhesion promoters including 29840, 29841, 52800, 52801, 52818, and 52826. Released between 2013 and 2017, they are used to print to difficult plastics, glass, and metal. 52800 is intended for plastic substrates and adheres to difficult plastics, melamine, and polyolefin. Pedro J. Martinez, CEO, Afford Industrial, recommends 52801 in place of 52800 for a “greener” solution. APEX announced in September 2017 a new UV primer with low volatile organic compounds that enable UV inks to obtain superior adhesion on glass, cermaic tiles, metal, acrylic, PVC, and PET. The product offers chemical resistance and good flexibility, is color rich and waterproof with light fastness anti-oxidan properties. Bordeaux Digital PrintInk Ltd. provides CLEAR GP for glass substrates and CLEAR PL for plastic substrates. CLEAR GP not only enhances adhesion, it decreases ink drop deflection and the possibility of attracting new particles to the substrate during printing. CLEAR PL—in addition to enhancing adhesion—is fast drying, offers low odor, and acts as a general cleanser for substrates prior to printing. Fujifilm North America Corporation offers Uvijet adhesion promoters ZE1000, ZE720, and ZE680. They are developed to aid in the adhesion and abrasion resistance of Fujifilm’s Uvijet digital ink systems onto acrylic, PVC, digital grade styrene, and coroplast. Innovative Digital Systems’ (IDS’) IDSPR 601 is designed to improve adhesion of UV ink to glass, tile, and metal surfaces. It is a clear primer that can be applied by hand or with a roll coater, airless sprayer, or squeegee. Once applied, the company suggests the adhesion promoter be run through a drying tunnel or another type of indirect heat at 150 degrees Fahrenheit for five to ten minutes. For the printed product in most cases, the best adhesion properties are achieved allowing the promoter to cure for at least 24 hours before printing. Inkcups Now manufacturers several adhesion promoters for inkjet printing, including XJET – Glass Boost (ICN – GB Primer). One of its newest products, it is designed as an aggressive glass, tile, or metal primer to offer outstanding adhesion on glass and tile. The primer is part of the XFlexx UV LED flexible ink series, which is compatible with Inkcups’ X2 flatbed UV printer and the XJET printer. INX Digital offers BondAid 1, BondAid 2, APPL, and APGT adhesion promoters. BondAid 1 is specially formulated to improve adhesion on metal, glass, and tile. 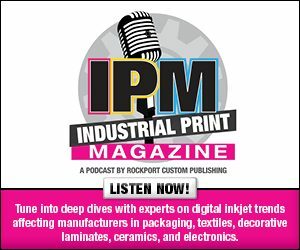 According to Susie Mendelssohn, sales manager and international marketing manager, INX Digital, one liter of INX Digital’s adhesion promoters will cover approximately 400 square feet. “The goal is to provide an even layer of material over the entire substrate,” she offers. INX’s liquid adhesion promoters are applied by hand. Stay tuned for the third part in our series on adhesion promoters to learn about more vendors and their products. Click here to read part three of this exclusive online series, Helping to Adhere.